Events for 25+ — Pop Up Picnic Co. Pop Up Picnic Co is one-stop shopping: we handle all the food, drinks, seating and decor. Whether it’s a friend’s backyard or the field where you start your favorite hike, we’re equally prepared to set you up in style. Seating: Original Pop Up Picnic tables + chairs or Boho Pop Up Picnic tables + pillows. We believe that your event should look amazing- like ‘magazine-quality, pinterest-worthy, I gotta instagram this’ ah-mah-zing. That’s why everything we bring is curated to create ambiance. 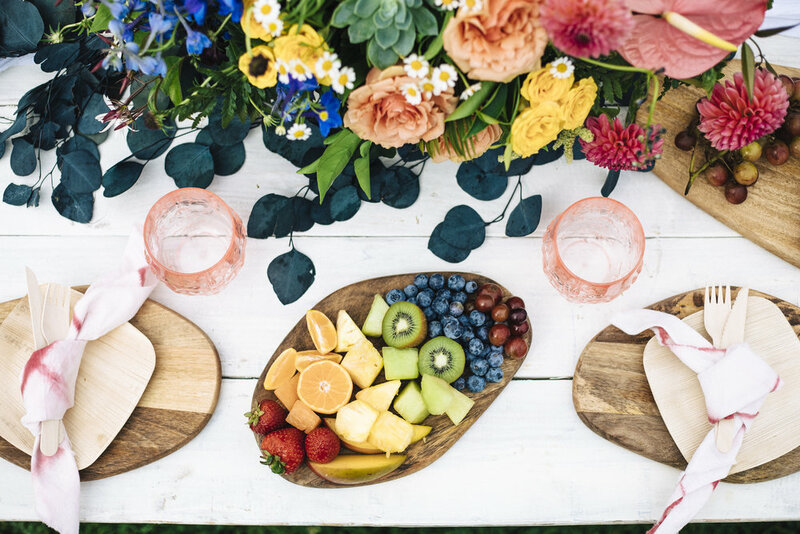 From handmade farm tables, to hand-dyed napkins, we’ve styled every inch of your Pop Up Picnic- even your food display is ready for its closeup. Our look is clean, contemporary and fun. We love lots of bright white with pops of bold colors and texture- especially our signature pink shibori. We also offer custom designs for the right occasion. If you like our style and want to collaborate for your unique event, just let us know. Pop Up Picnic Co. works with businesses of all sizes to offer a fun and unique way to get together. The best part of booking a Pop Up Picnic is not having to deal with any of the planning, setup or cleanup. We bring everything you need for your event: food, drinks, seating and more. Your special day is usually accompanied by a LOT of planning and several other events before and after your wedding day- why not let Pop Up Picnic Co. help out a little? We bring everything you need, from food to furniture and even offer custom decor options so you’re bridal event will look JUST how you imagined. Don’t forget about the Baby Shower down the road!